The Los Angeles Times and Food & Wine Magazine joined forces over Labor Day Weekend to present The Taste, a four-day culinary festival that featured nine events in Beverly Hills, Hollywood and Downtown. 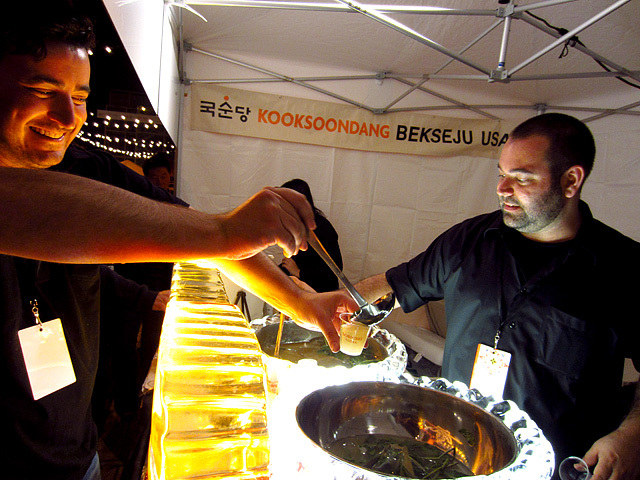 Tickets for each event cost $125-150, and included unlimited bites from dozens of restaurants; endless samples of beer, wine and spirits; as well as seminars and demos. The Taste kicked off on Friday with Burgers & Beer (featuring craft brews curated by The Beer Chicks), and concluded on Labor Day with the family-friendly Picnic in the Hills, hosted by Giada De Laurentiis. The second event on Friday night was the Art of Mixing, which took place on the back lot at Paramount Studios. Not long after checking in and getting oriented, I came upon the distinctive meter maid truck of Ice Ice Shavie. From inside the booth, Silamith Weir served the refreshing Blackberry Bramble: gin, lemon, blackberry and basil. 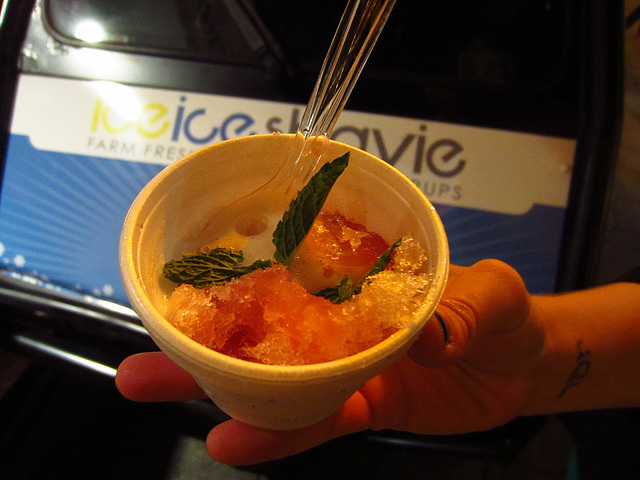 The other shave ice offerings were the equally enjoyable VW (elderflower, grapefruit, vanilla) and the Mojito. New from Encanto: the Distiller's Reserve Single Vineyard Quebranta Pisco. 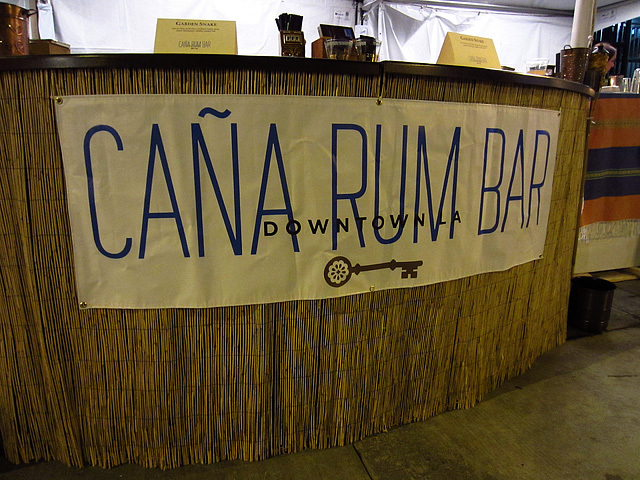 Nearby was the Campo de Encanto Pisco booth, where Adrian Biggs (La Descarga) was serving a delicious Pisco Punch (pictured at top). 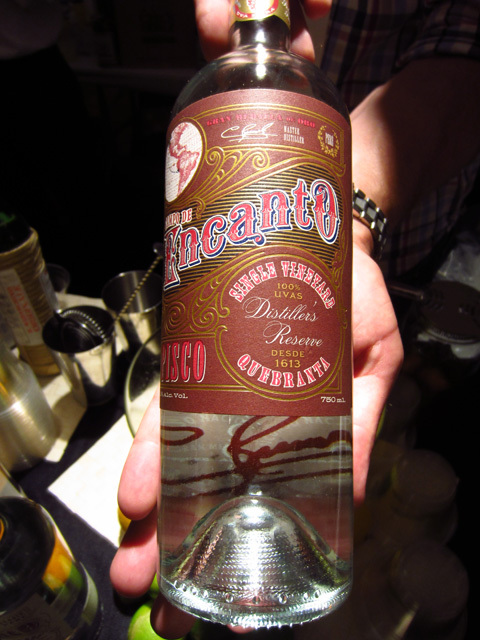 Encanto CEO and Cantina proprietor Duggan McDonnell was on hand to discuss his award-winning spirit, and graciously offered a taste of Encanto’s upcoming limited edition release, the Distiller’s Reserve Single Vineyard Quebranta Pisco. Earthy, complex, with a smooth finish that goes on for days, the Distiller’s Reserve is scheduled for release in October and can’t arrive soon enough. Over in the Classic & Vintage Artisanal Spirits booth, Lindsay Nader (Harvard & Stone) and John Coltharp (Tasting Kitchen) were mixing cocktails like the Dizzy Oaxacan: Sombra Mezcal, Averna Amaro, grapefruit juice, lemon juice, agave nectar, ginger beer. 320 Main's Erik Trickett and Jason Schiffer serve the Moscow Mule Royale. 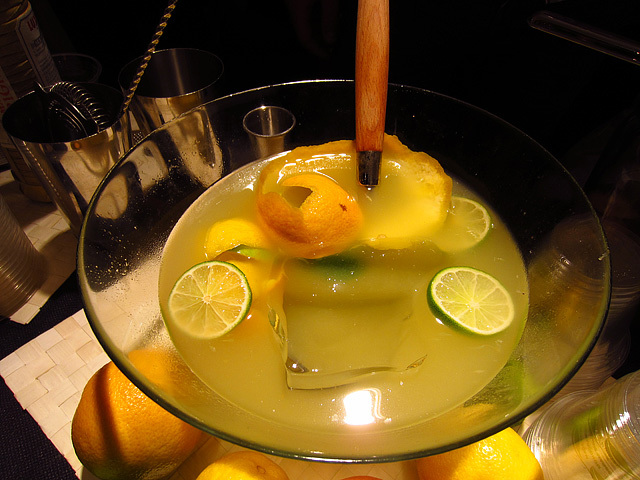 Just down the “street,” Jason Schiffer and Erik Trickett of 320 Main ladled servings of the Moscow Mule Royale punch: Sobieski Vodka, fresh ginger, fresh citrus, cane syrup, sparkling wine. After watching a cooking and mixology demo by Ricardo Zarate, John Rivera Sedlar, and Julian Cox, I did as I was told and headed over to Chevalier. While the 3 & Tree Royale pictured above went to another guest, Chevalier made me a Deviled Negroni: No. 3 London Dry Gin, Luxardo Bitter and Maurin Quina. Chevalier’s booth became the unofficial hangout spot as the Art of Mixing wound down. As you can see, Encanto’s fans made sure that neither the spirit nor the punch would go to waste. 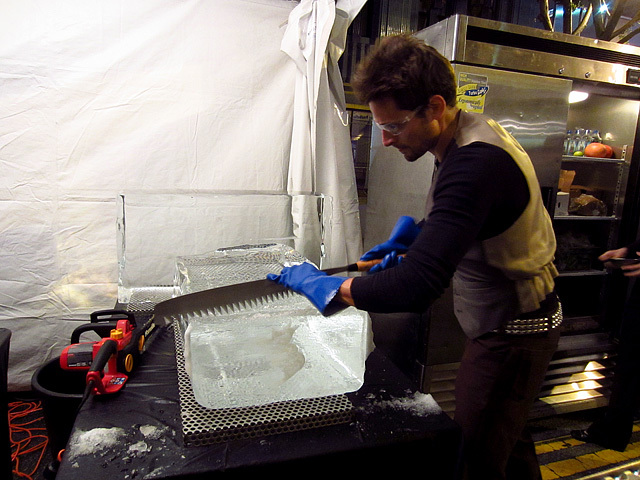 Eric Alperin sawing ice slabs for The Varnish. On Sunday night, The Taste moved to Downtown LA for Food Noir, which took place on Broadway between 8th and 9th. Not far from the entrance was the tandem of Cole’s and The Varnish, where co-owner Eric Alperin was sawing slabs of ice for cutting into properly sized cubes. Cole’s served a 1930’s Rye Buck, made with Bulleit Rye, lime, ginger syrup and soda. A perfect sipper for strolling down Broadway as the various booths prepped for service. The rye cocktail lasted just long enough for me to reach the other end of Food Noir, where Seven Grand was serving a Ward 8, while Caña Rum Bar offered the Garden Snake: Don Q Añejo, fresh citrus, backyard tomato syrup, Amaro Montenegro, Maldon Smoked Salt. Next door, Las Perlas featured the Spiced Daisy, made with Chinaco Tequila, jalapeño/cucumber/cilantro juice, lime, agave nectar and Royal Combier. 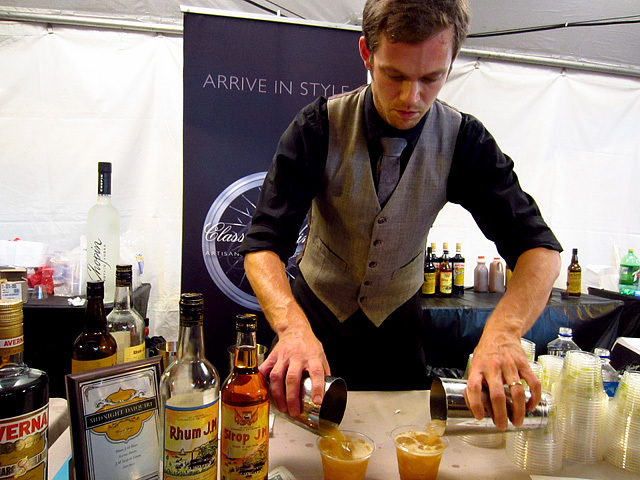 In the Classic & Vintage booth, John Coltharp mixes two Midnight Daiquiris. Coltharp was once again in the Classic & Vintage booth, and I sent several people to visit him for the excellent Midnight Daiquiri: Rhum J.M Blanc, lime juice, J.M Sirop de Canne, Averna Amaro. A Warner Bros. cartoon, as it was meant to be seen. One of the highlights of the weekend had nothing to do with food or drink. 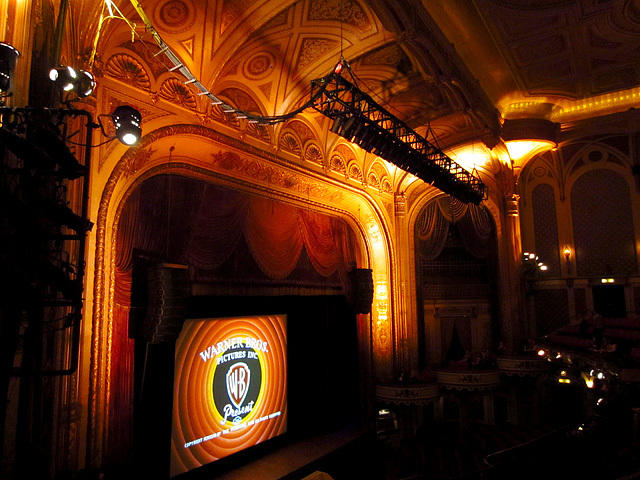 Inside The Orpheum Theatre, the Los Angeles Conservancy presented classic Warner Bros. cartoons, vintage newsreels and trailers for legendary movies from Alfred Hitchcock, Cecil B. DeMille and more. It doesn’t get much better than watching One Froggy Evening as it was meant to be seen: on the big screen, with an audience, in the magnificent setting of The Orpheum. Actually, it did get better; it was only a short walk from The Orpheum to Cole’s and another round of 1930’s Rye Bucks. 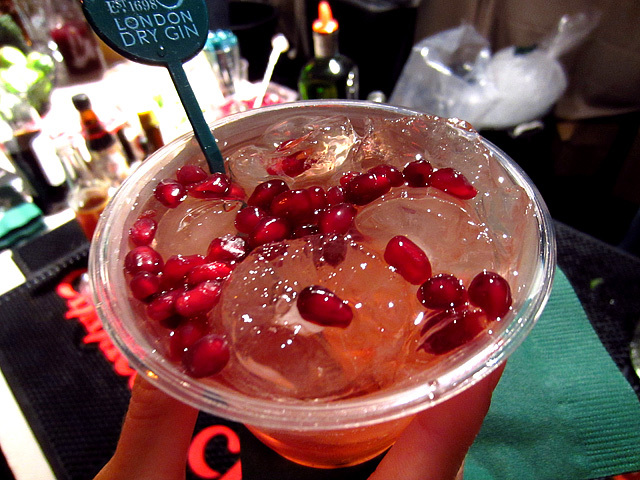 For more images from The Taste, visit the Thirsty in LA Facebook page. 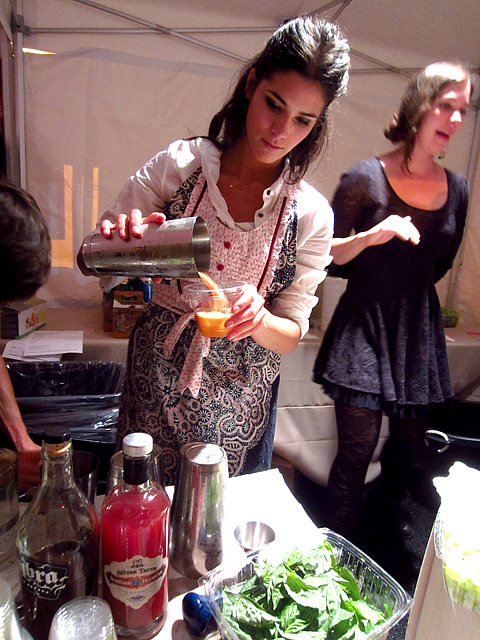 Lindsay Nader makes a Dizzy Oaxacan at Art of Mixing. Combine first four ingredients in a mixing tin. Shake and strain into an ice-filled highball glass. Combine all ingredients in a mixing tin. What Would LA Bartenders Do with 24 Hours?